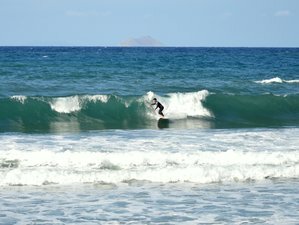 Surf in Crete invites you to a three-day surf camp on beautiful Crete Island, in Greece. New surf soft boards for all sizes and levels, epoxy boards for performance levels, wetsuit and lycra shirts, along with surf theory lessons, surf performance coaching, and surf guiding with professional instructors are what you can expect during your entire stay. You will be accommodated at Light Filled Apartments and Studios. The apartments are equipped with private bathrooms, balcony, kitchen, free Wi-Fi, and have sea views. Options for one, two, four, and six persons are available. There is a beach bar and snack bar for your day needs and a kitchen and barbeque area in your apartment's open area for your night needs. A Surf in Crete representative will pick you up from the airport, located just 10 minutes away, with the minivan. You will come and meet the wonderful host, Katerina, in the most beautiful environment ever, with an amazing sea view from the top. Your day will start with a nice coffee up on the apartment's wonderful sea-view balcony, then you will move down to your home spot, Arina Beach, just one minute away on foot. You will make your day plan depending on the weather conditions, for a double session in the morning and in the afternoon. Surf in Crete are interested in your maximum satisfaction, so if conditions are not so good, they will move you to their home spot, where conditions are usually the best, which is why they are located there. Surf in Crete's target is to mix sports with the amazing Cretan culture. They provide the best certified ASI instructors, surf rescue, rescue boats, first aid and aid on spot, full equipment insurance, and the best private insurance with a helicopter service for your maximum safety. Marios Trigonis is an ASi and iKO L3 instructor, sea lover with experience on wind and waves. He loves sports and water is his second home, surfing around the world, always looking forward to new experiences. Safety during teaching is a must for him and he is always in the water with his people. He is one of the top water sports instructors in Greece. His surfing, teaching, and coaching experience is vast, with more than 2000 certified hours of teaching. Light Filled Apartments and Studios are located on Arina Beach, in Kokkini Hani, Heraklion, Crete, Greece. There are six more spots around, on a 15 kilometers radius. You can also visit downtown which is located five minutes away, with lots of traditional restaurants and nice open-air bars. Surf in Crete offer various surfing, kitesurfing, and stand up paddle boarding courses, as well as surfari and many other services.